On the launch event of iPhone X, other than the full OLED display, the talk of the town was the Animojis. They are animated emojis hence, Animojis. They use the iPhone X face ID technology to animate emojis. So if you have a Panda Animoji open up, you can actually animate it with your facial movements, both the movement of your lips, face, and expressions. Now, this Animojis is only available for one of the iPhone, and that is the iPhone X. So if you have an iPhone 8 or iPhone 8 Plus and want to use this feature, we regret to tell you that it is not available on your iOS device. But what about the Android users, do we have Animojis on the Google Play Store? 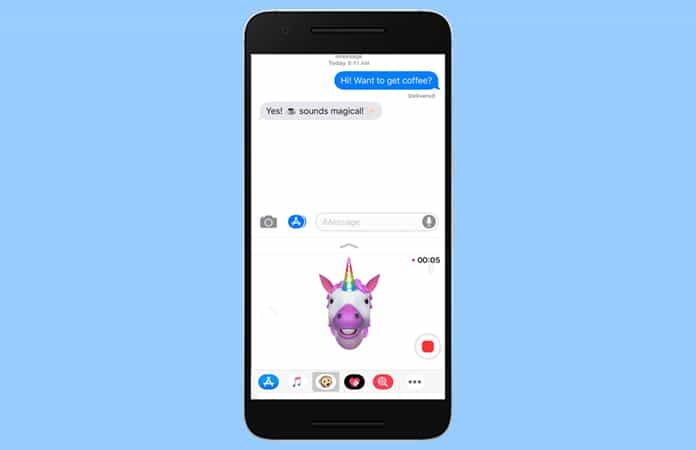 Is there an iPhone X Animojis alternative for the Android devices? No and Yes, I thought there is not any Animojis for Android, only exclusive of iPhone X yet, maybe in the future, Apple will release it for everyone. But we have iPhone X Animojis alternative available on the Google Play Store for your Android devices. Before we begin, we just want to clarify that you won’t get the similar polished looks as the Animojis. And why is that you may ask? Well, like we said Apple use the advance iPhone X Face ID and sensors to make a 3D model of your face. Then it uses that 3D model to replicate the emoji on it, and lets you animate till your heart contents. But saying all that the iPhone X Animojis alternative mentioned in this post does a fairly good job of imitating the iPhone X Animojis. If you’re looking for the best replica of the iPhone X Animoji, then the, Animoji for phone X + Live Emoji Face Swap Emoticon, is the app for you. Now, this app can be found in the Google Play Store and you can download and install it on your Android device for free. So, when you launch the app you will see many of the emotions displayed on the main screen. Here, you can just simply swipe from right to left and discover more emotions. After choosing the emoticon you want to use, place the camera on your face and choose it. Follow the instructions displayed on the screen to create Animojis on your Android phone. After choosing the emoticon, you can produce a video which lasts 10 seconds. Just tap on the recording button, to record the 10 sec video. Now, you can move your head up and down, left and right but the only drawback is there are no facial features, just the stock emoticons. We get it Animojis for iPhone X is cooler. But hey, do try these iPhone X Animojis alternative for Android. 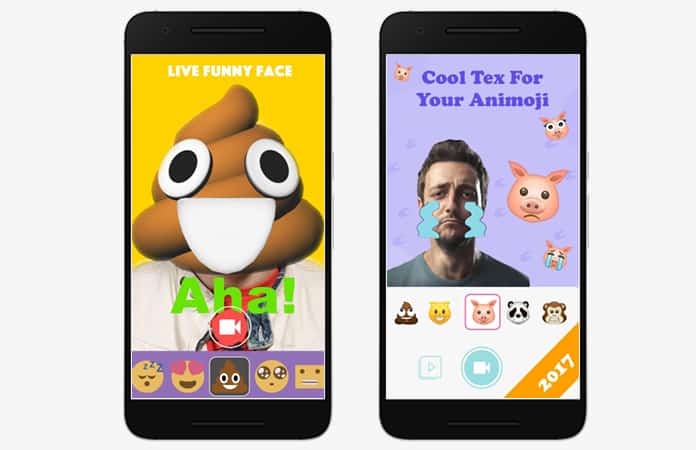 This is another free iPhone X Animojis alternative Android app. This app will let you make one-of-a-kind live emojis. Though this app is not that similar to the iPhone X Animojis, but they do offer some unique feature to try. So when you’re on the app screen, you will have the option to create your own emoji by tapping on the ‘New Emoji’ option. Or you can, just scroll down the screen to select stock emojis that are displayed by popularity. 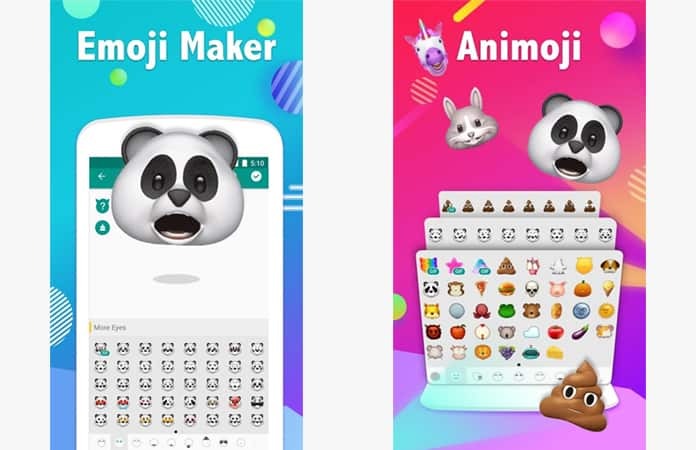 However, when we say the Emoji Maker app lets you make emoji from the start on your Android device, it is not exactly what iPhone X Animoji lets you do. Like mentioned above we are trying to say that it does not use your facial structure to create the emoji. Nonetheless, the thing that impressed us the most about this app was that the customization feature. So you can customize, hair, eyes, face and more. Warning! Though this app is free, it makes money by showing ads after ads. So if this does not bother you then, go ahead install this app and create emojis. Let us know in the comments below if you know any other iPhone X Animojis alternative for Android?